James “Jim” Dayton Eagle, Sr., 85, of Granbury, passed away on Monday, October 29, 2018. Graveside service: 1:30 PM, Friday, November 2, 2018, Granbury Cemetery, Visitation: 10:00 AM – 12:00 PM, Friday, Wiley Funeral Home, Granbury. Jim was born on May 28, 1933 in Ivydale, West Virginia to Nathan and Sadie Eagle. 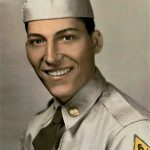 He was drafted into the United State Army and served in Germany. He loved watching baseball, especially the Cleveland Indians. He enjoyed travelling, going on road trips, and bluegrass music. He was known for making biscuits and participating in Chili cook-offs. He was a member of Thorp Spring Baptist Church and volunteered at People Helping People. He was preceded in death by his parents, wife : Anna Mae Eagle, siblings, Edmond Eagle, Vernie Eagle, Dorsal Eagle, Faye, Tressie Grose, Dorothy, Lena, and Betty. Jim is survived by his wife: Juanita Eagle, son: James Eagle, Jr. and wife Sasha, grandchildren: Dayton Christian and Zachary Travis, stepdaughter: Robin Camp and husband Doug, grandchildren: Stephen, James, Elizabeth, Catherine, Jane and Mary Grace, daughter: Mollie Reed, grandchildren: Tim, Jason, Kaitlyn and Jessica, siblings: Nancy Smith and husband Bob, and Charlie Eagle and many nieces, nephews, and cousins.